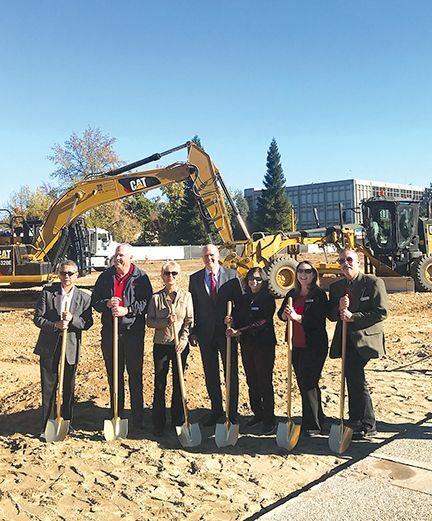 SACRAMENTO, CA (MPG) - This Fall the campus of American River College has provided new challenges for students and staff with the groundbreaking of a new Science, Technology, Engineering, and Math (STEM) building. The 38,000 sq. ft. three-story building will replace the Liberal Arts Wing that has existed at the college since the 1960s. The demolition of the Liberal Arts Wing has forced students and staff to abandon routine parking lots, walkways, and drop off points formerly familiar, a necessary complication to a much needed infrastructural upgrade. Design elements of the new building will provide shared, flexible and movable space and labs for programs and disciplines that include Business & Computer Science, Mathematics, Astronomy, Physics and Engineering. The second phase of the project will benefit the Science division (which produces 47% of ARC's graduates and is the largest division in the Los Rios Community College District) with long-awaited lab space modernization and state-of-the-art wet labs for biology and chemistry. Many successful and notable alums in the fields of science, healthcare, engineering, biotech and research have benefited from their start at American River College. This new STEM Center will offer greater opportunities to even more students. ARC has launched a major fundraising effort for STEM Innovation and 21st Century Science. This campaign will seek to raise $3.5M in private support and provide a margin of excellence for students in both phases of the project. Private funding will be used to enhance the construction with industry lighting, technology and lab equipment.